Privacy is dead. No one's data is safe. There's no escaping from the machine, and the machine knows all. So goes the common messages of doom and disarray every time we see a new report showing the amount of personal information being broadcast online for all to see. And the latest is no different - though admittedly, this one is a doozy. A group of researchers from the University of Cambridge and Stanford University have found that insights gleaned from Facebook data alone may be able to predict a person's personality and preferences better than their colleagues, their friends, even their partners. Their testing even showed that, in some cases, Facebook data knew people better than they knew themselves. Such findings are bound to spark concern - maybe Elon Musk was right and the days of SkyNet and us bowing down to our robot overlords are closer than we're even aware. This research has already raised the hackles of concern of concern amongst internet privacy advocates - and by all means, there is a very valid basis for such concerns, but one of the main contenders amongst common privacy issues is that such information might fall into the hands of advertisers who'd be able to target people with personalised ads. For me, that's not such a concern. I mean, advertising's everywhere, right? The average person's exposed to more than 250 ads per day (and that's a low estimate), ads are a fact of modern life, one way or another - so why not be shown ads that are relevant to your interests and that you actually might want to purchase? "If, for instance, several people who liked Snooki on Facebook also scored high in the extroverted category, the system would learn that Snooki lovers are more outgoing. The more "Likes" the system saw, the better its judgment became." On a small scale, such results might not mean much, but at such large volume, those correlations become pretty indicative, so much so that, as noted, when friends and family members were quizzed on their knowledge of the test subjects, their responses were not as accurate as what the researchers could glean from Facebook data, matched against the participants own responses in behavioural testing. This study highlights the amazing range of insights available to us in social media data. Privacy concerns aside, the benefits of such analyses are far-reaching - the possibilities for the early detection of health issues, the ability to better detect and respond to psychological distress, the opportunity to guide people towards better career and lifestyle choices more suited to their personality traits - these are just some of the major potential benefits of big data and integrated learning. And then there's the possibilities for marketing, the elephant in the room in the wider big data conversation. While, of course, such information can be mis-used, there are also significant benefits in connecting brands to people who're most likely to be interested in their offerings, in linking people to products and services relevant to them, at the precise time that they need them. Yes, it can be creepy, especially when you see those side-bar ads for that thing you just wrote about in an e-mail, but the opportunity is there to build a more collaborative commercial system that's more responsive, more efficient, and functions at a more optimal level for both business and consumer. If Facebook data can determine the specifics of a person's psychology and behaviour, imagine how powerful that would be in helping a small business find the right audience and get itself started? Right now, you could build a profile of all of your customers, narrowed down to those who've made a purchase to eliminate the 'observers' in your community, and you could create an interest map of your most likely future customers based on the preferences and shared interests of your previous interactors. 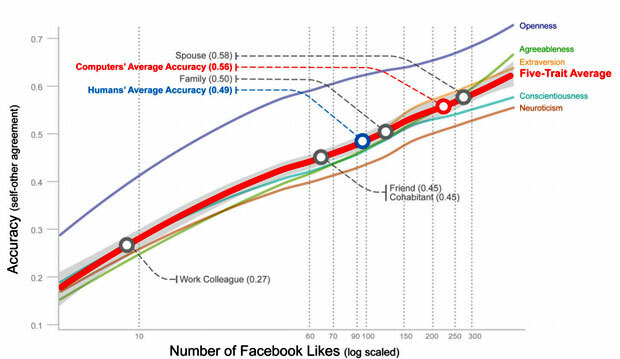 Essentially, this is what Facebook's 'Lookalike Audience' feature already does, the data points they've used in this study are similar reference points to the ones they use in that algorithm - if you weren't sure of the potential of that option (or even that option's existence), these results might make you think twice. But even without access to the whole Facebook dataset or their team of expert analysts finding patterns and correlations, you can conduct your own audience research, you can establish similar insights on a smaller scale. If Facebook likes can tell you who a person is, you have to believe that the data you can glean from an engaged community is worth the effort of building it in yhe first place. The power of social media data should not be ignored, it's the most valuable audience insight tool we've ever had. Used well, and used ethically, it'll likely become the key resource in your marketing and outreach efforts. The trick is to know what to look for, where to find it, and also, how to rationalise that info to maximise the benefits for both you AND your customers.